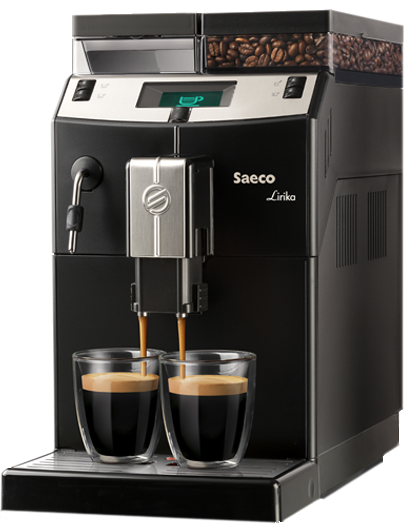 Saeco Manually Pressurized light 2-cup filter holder. 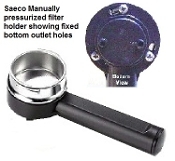 Saeco pressurized filter holder with 2-cup filter basket. 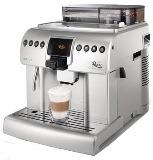 Used for Pavoni pump models ESPRESSO SI, ESPRESSOCAPPUCCINO; Saeco ESPRESSO CLASSICO, ARMONIA, ARMONIA EASY, AROMA, CLASSICO SELECTA, ESPRESSO DREAM, GRAN CREMA, GRAN CREMA DELUXE, MAGIC CAPPUCCINO, MAGIC COMBI, MAGIC ESPRESSO, MAGIC ESPRESSO COFFE CAP, MAGIC ESPRESSO REDESIGN, NICE COFFEE, VIA VENETO COMBi, IDEA. The heavy portafilter #T4003) has been discontinued & no longer available. 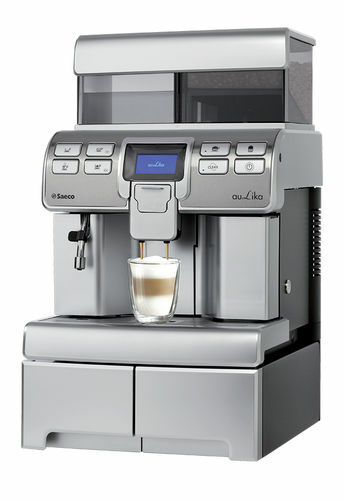 The light portafilter Part (#T4002) works as good as heavy type or with tapered grip handle T4001). For best results, use coarse coffee grounds (like the table salt). Do not adjust grind fineness by number on the knob. Feel the fineness between thumb & finger. Fill the filter basket with grounds and level it by running small finger across and lock it in the machine. No tamping. Pull the handle to the right all the way and hold it as you turn the switch on for pump to operate. Initially the water will not pass through coffee as the grip is on hold, pulled to the right. This blocked flow of water builds extraction pressure to 9 bars in 6 to 8 seconds. Do not pay attention to what is stated on coffee forums. To clean the portafilter, rinse under tap water and make one last blank shot of espresso.